The curious and the committed crowded into Sydney’s City Recital Hall on 25 September to explore the range and depth of contemporary experimental music and were rewarded with superb performances midday to midnight by leading Australian artists and ensembles alongside America’s Bang on a Can All-Stars. The Extended Play Festival occupied the hall’s auditorium, studio and multiple foyer spaces yielding continuous action and a sense of intimate communality and celebration. Extended Play opened explosively with ELISION Ensemble Artistic Director Daryl Bucklely, on electric lap-steel guitar with electronics, powering his way through Aaron Cassidy’s fiercely swooping, subtly looping and frenetically buzzing The wreck of former boundaries. I first heard this as a half-hour work for large ensemble at the 2016 Bendigo International Festival of Exploratory Music (BIFEM) and subsequently on CD (NMC Recordings). The wreck… is modular, yielding short solo outings like this one and various instrumental combinations. You can hear an earlier account of Buckley’s riveting solo posted by Cassidy on YouTube. In stark contrast, Graeme Jennings performed Liza Lim’s ethereal The Su Song Star Map for solo violin, musing, conversing, growling and soaring with an ear-ringing cosmological purity. It was written for Ashot Sarkissjan, who plays it here. Buckley, Peter Neville on percussion and Tristram Williams on trumpets performed Richard Barrett’s world-line (hear an earlier account here) with fascinating variations in instrumental interplay yielding a performance akin to watching an intensively communicative jazz ensemble. I was entranced, again, by Buckley’s playing: rapid high-note plucking, powerful attack and swirling, gliding notes produced by the brisk rotating of the steel slide. ELISION provided a perfectly head-clearing, provocative introduction to Extended Play. A tight schedule, some poor door management and over-crowding in the small studio denied me New York-based pianist and vocalist Lisa Moore’s rendition of Philip Glass’s Piano Etude No 2 and most of Randy Newman’s “I Think It’s Going to Rain Today.” But the balance of this intimate recital was richly rewarding. New York composer Martin Bresnick’s Ishi’s Song was inspired by the story of the last remaining Yana-Yahi Native American, Ishi, who walked off the land in the early 20th century speaking a language no-one understood but which was phonetically transcribed and recorded on an Edison cylinder by anthropologists. The opening sung melody of the piece is based on Ishi’s singing of a healing song, for which there is no translation. The piano then gently ripples and flows on without the voice with a late increasingly dance-like intensity only to ebb with Debussyan depth and delicacy into poignant silence. 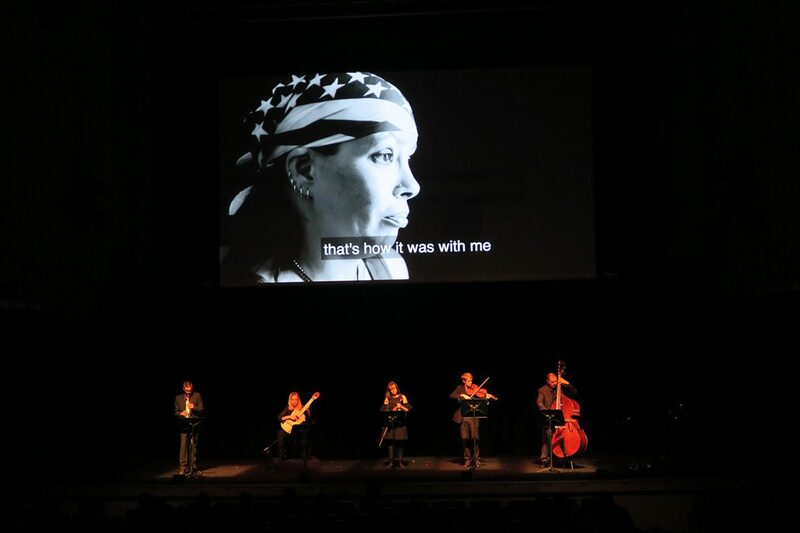 Once contextualised, Ishi’s Song speaks with specific eloquence of loss of culture, of language and lives — Ishi’s people had been massacred, their land ruined. In Sliabh Beagh, Moore as commissioner-performer and Australian composer Kate Moore inhabit their long-ago Irish origins, lyrically at first but then with a tad melodramatic forcefulness resolving into an emphatic Irish folk dance (you can see this work’s Mt Stromlo Observatory premiere here). The highlight of Moore’s recital was American composer Frederic Rzewski’s De Profundis, a dramatic rendition of excerpts from Oscar Wilde’s anguished prison letters to his young lover. 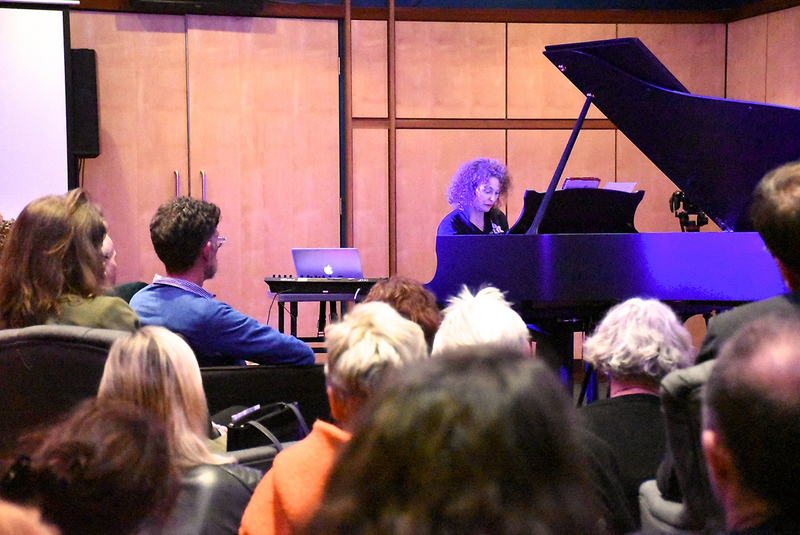 Spoken text, sudden gasps, cries, song fragments, roars, fearsome body slapping and head-holding are tautly meshed with dramatic pianism revealing Moore’s talent as a pianist-vocalist; definitely one of Extended Play’s highlights. Moore’s performance celebrated Rzewski’s 80th birthday. Ensemble Offspring enthralled its auditorium audience with a celebration of 82-year-old composer Steve Reich, juxtaposing two relatively recent works, Double Sextet (2008) and Radio Rewrite (2012) for large ensembles, with a percussion version of Vermont Counterpoint (1982), the recorded percussion component arranged, with Reich’s permission, by performer Claire Edwardes. Originally composed for alto flute and 10 recorded flutes, Edwardes’ bravura account conjures a ringing, crystalline world of escalating accumulations and magical gear-shifts, realising a memorable real/virtual dialogue. In contrast to the rigorous intricacies of this mid-career work, Double Sextet and Radio Rewrite have a distinctively more lyrical feel, not least in their reverie-like slow movements. 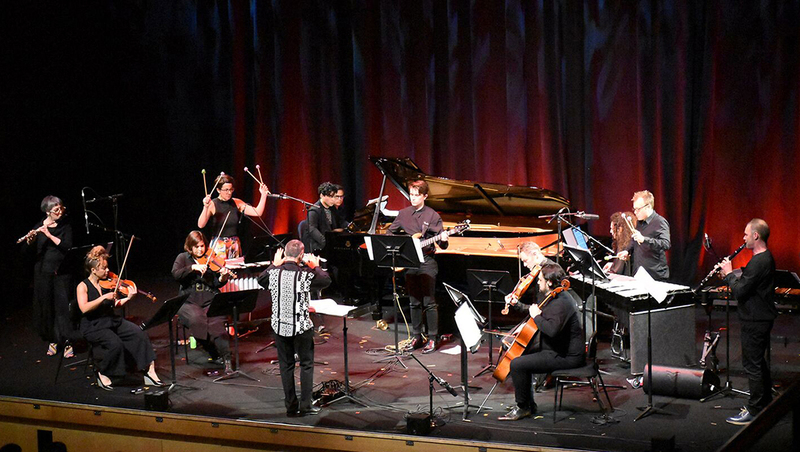 The ensemble opened its program with the immediately deeply engaging electric bass- and piano-driven Radio Rewrite, with the other instruments soaring. The work borrows from, if deeply embedding, the Radiohead songs “Jigsaw Falling into Place” and “Everything in Its Right Place.” Reich has explained that the former’s opening chords provided the impetus for the work’s three fast movements and the harmonics of the latter the two interpolated slow movements. Whether or not you know the songs, Radio Rewrite is a beautiful standalone work, the sparely scored slow movements particularly affecting, the second one, even more spacious than the first in the ensemble’s sensitive reading, is imbued with a dark melancholy from which we are released with a final joyous dance. 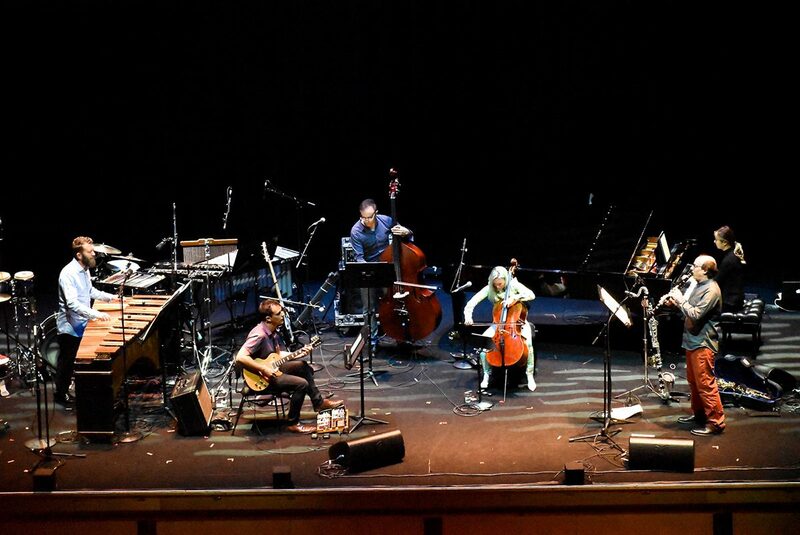 The ensemble’s performance of Reich’s Double Sextet granted us the luxury of two live sextets — flutes, clarinets, violins, cellos, vibraphones and pianos. 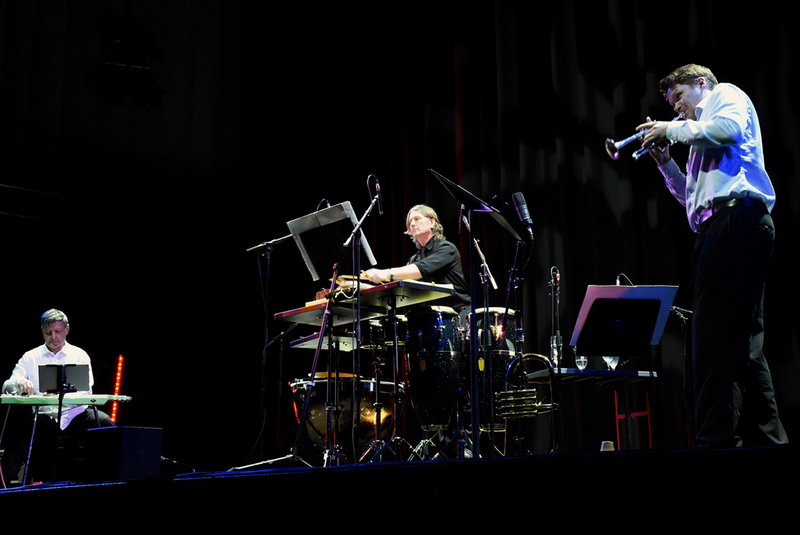 Often performed by one sextet against a recorded part, here we witnessed the subtle interplay between the two groups with minimalist big band verve. Again there were oscillations, quite rapid, between fast and slow passages with a melodically plangent slow movement dominating the central third of the work, before the pounding ride home, interlocking percussion and pianos driving hard, fractionally slowing and pushing ahead — all credit to Edwardes on vibes and Zubin Kanga and Sonya Lifschitz on pianos, and superb ensemble playing all round. The South Australian pianist and leader of the Soundstream Collective talked us through and played piano works for the most part commissioned for her Of Broken Trees and Elephant Ivories project, inspired by colonial pianos and, in four pieces, the no-longer playable instrument housed behind glass in the old Alice Springs Telegraph Station, originally installed, no doubt, for the pleasure of the station master and family. De-commissioned, the station was then used to incarcerate Indigenous people including as an orphanage for Stolen Generations children. David Harris’ Station Chains unfolds like an unstable dance with alternations between anger and elegy. In Picnic at Broken Hill, Jon Rose has MIDI-converted into a piano score the written protests in 2015 of Afghan cameleers over the attempted World War I invasion of Turkey. After attacking locals, the two men killed themselves. Smart retained the vocal renderings of the text adding them to the performance, with one voice declarative and the other a reverberant whispering. Luke Harrald’s Intensity of Light deploys a recording of the artist Hans Heysen celebrating “the intensity of the light” in Central Australia while fearing it being forgotten. Harrald breaks up and repeats fragments of the tape of Heysen’s warmly resonant eloquence to suggest fragility and a sense of loss. It’s eerily evocative if, for whatever reason, at times dramatically overwrought. James Rushford’s Haunted Place is the least literal of the commissions, quietly and lucidly suggesting the beauty of the old piano even though, as Smart reminds us, it sits behind glass. Elena Kats-Chernin’s Piano Memories evokes the instrument brought to life with a lilting old-world expressiveness that reminds us of the cosmopolitan spirit the piano, along with the telegraph, could bring to even the remotest of places. 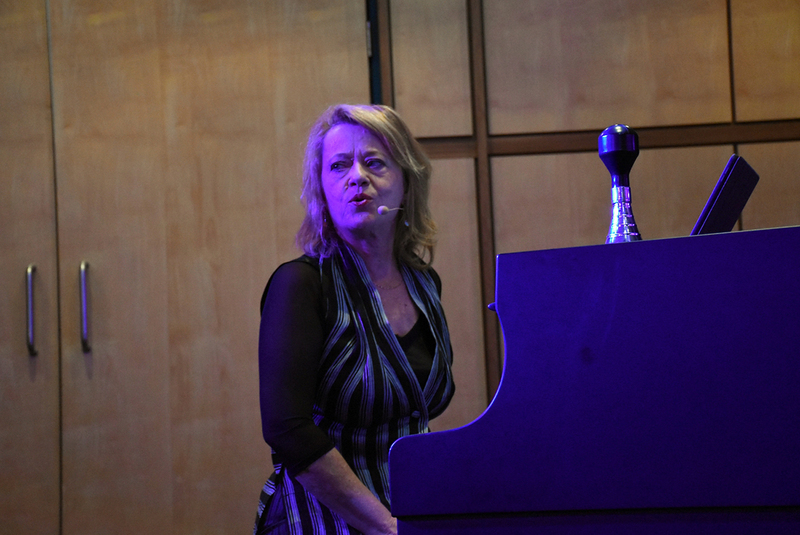 Other pieces included Cathy Milliken’s Steel-True Gold-Sole, celebrating the culturally adventurous novelist Robert Louis Stevenson with piano and flageolet and concluding with a brief recording of the one opportunity Smart had to record the writer’s piano at Sydney’s Powerhouse Museum before the instrument was suddenly declared unplayable. Cat Hope’s The Fourth Estate was palpably experimental. Composed for solo piano, AM radios and Ebows (hand-held, electronic bows applied to the piano strings) it’s a generative work of variable ordering. This is the second time I’ve seen it performed (experience Zubin Kanga’s account here); it continues to be mysterious, yielding moments of lyrical pianism, neat piano and harpsicordish unison, keyboard fury and passages of hum and radio static. While there’s nothing seemingly literal about the work if you don’t know its purpose, Hope’s agenda is explicit in its defence of an embattled democratic media: “As the Fourth Estate is thought to be an element of society ‘outside’ official recognition, here the electronics attempt to pull the piano into a different sound world outside its usual realm.” The Fourth Estate was best experienced with eyes shut, eliminating the various visual machinations of its making. In another Extended Play highlight, the Bang on a Can All-Stars program celebrated early works by the band’s founders — David Lang, Michael Gordon, Julia Wolfe — and aptly added Philip Glass to the roster alongside the UK’s Steve Martland and Australia’s JG Thirlwell, revealing the incredible diversity of what can be limitedly labelled as post-minimalism. David Lang’s Cheating Lying Stealing successively orients and disorients the listener with its spacious, tense beat, disturbing hesitancies and a mournfully growling cello, expressive of guilt and regret. Overtly and playfully Reichian, Michael Gordon’s Gene Takes a Drink was inspired by the wanderings of his cat and originally accompanied by a delightful cat POV film (a cut above the usual kitty videos, it can be found on YouTube). Conflicted with internal tensions, Julia Wolfe’s Believing is furiously paced from the start, but with cellist Ashley Bathgate’s long-noted wordless singing the work suddenly achieves a kind of transcendence without surrendering propulsion. Philip Glass’s aetherial Closing provided easeful counterpoint, and was in turn countered by JG Thirlwell’s riotously Grand Guignol Anabiosis. The late Steve Martland was celebrated with a powerful rendition of his Horse of Instruction imbued with rock and jazz drive. In the spirit of that work, the band encored with the quick-fire fifth movement of American composer Marc Mellits’ Five Machines. As ever Bang on a Can met complex challenges with precision and pristine clarity, complementing Ensemble Offspring’s equally illuminating performance of Steve Reich works earlier in the day. There were other engaging dimensions to Extended Play, including a theremin workshop, a much-lauded Brett Dean-Zubin Kanga collaboration (which I missed as the event’s schedule became more complex), and numerous small group performances as well as an event-long exploration of Erik Satie’s Vexations by numerous participants in the hall’s main foyer. I also caught Love Stories, a collaboration between filmmaker Trent Dalton and Brisbane’s Topology, in which the director documents homeless people and staff at Brisbane’s 139 Club (now 3rd Space) talking about love. Topology, with guitarist Karin Schaupp provided affecting live accompaniment (composers Robert Davidson, John Babbage) to already emotionally rich material while avoiding the darker specifics of their subjects’ lives, which are largely taken as a given. Although needing a little fine tuning of its scheduling (it’s frustrating when you purchase a day-pass but can’t access preferred events) and crowd and space management, Extended Play proved to be an exhilarating festival, wonderfully supportive of local artists and ensembles, emerging talent and an audience eager to engage. Sydney needs more Extended Plays.